There are numerous individuals and groups in the Knoxville area that are very talented in Chinese Music, Dance, and other performing arts. The proximity of the University of Tennessee and Oak Ridge National Laboratory, each with strong Chinese communities, as well as the Confucius Institute at UTK and Confucius Classrooms at PSCC and King's Academy ensures that new talent is always arriving in this region. Furthermore, the numerous Chinese and international festivals in the region attract new talent as well. Please see the links below for information on some of the local performing groups. There are a number of opportunities to participate in Chinese dance groups for girls and women of all ages. As part of its Chinese culture curriculum, the East Tennessee Chinese School (ETCS) has dance lessons each Sunday morning from 11:30am - 12:30pm at Pellissippi State Community College. Currently, the younger students are learning traditional Chinese dance from Coach PAN Ying, while the older students are learning Chinese Hip-Hop dancing from Coach Belinda Loi. These dance groups regularly perform at the East Tennessee Chinese New Year Festival, as well as other cultural festivals in the area. For more information, please contact the current ETCS Cultural Director LIU Hong via email at jliuhong at hotmail.com. Formed in Autumn 2010 by YANG Hongtai, this group is comprised of University of Tennessee graduate students who choreograph and perform a variety of Chinese dance styles including Traditional, Hip-Hop, and Modern. They regularly perform at the East Tennessee Chinese New Year Festival, as well as other cultural festivals in the area. 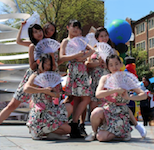 In 2013 they won Second Place at the UTK International Dance Competition. For more information on Dance Miracle, please contact Coach BI Meng via email at mbi at vols.utk.edu. To arrange for the troupe to perform at your function, please contact Director LIU Di via email at diliu at mindspring.com. The University of Tennessee has a number of students and visitors who play traditional Chinese instruments including erhu (Chinese violin), guzheng and guqing (Chinese zither), pipa (Chinese lute), and others. Recent performances include the Knoxville Asian Festival (LI Wenshu - erhu) and the CI@UTK Autumn Moon Festival (guzheng and pipa), and the East Tennessee Chinese New Year Festival (WANG Jing - guzheng, LI Wenshu - erhu). Currently, BI Meng is organizing these performers; for more information, please contact her via email at mbi at vols.utk.edu. The East Tennessee Wushu Team and the East Tennessee Tai Chi Team regulary perform demonstrations of Chinese Martial Arts, and sponsor cultural displays and interactive lectures on Chinese weaponry and martial arts. Please check back here soon for information on other Chinese performing arts in the area.